When he finished University diving became less important. Until he was introduced to PADI: this system could be better combined with his daily work. He did his rescue, divemaster and, finally, instructor courses with PADI (Course Director the late Reinder Alkema). He decided to start his own diving school. At that time Nitrox was introduced to the recreational diving scene. PADI didn't have nitrox courses: Pim did his first nitrox course with ANDI. Almots at the same time rebreathers were also introduced. Pim decided to start with a SCR (Dolphin) and later pick up the Inspiration (Classic) eCCR. For the Inspiration (which he bought second hand), he had to do his courses in the UK, with Kevin Gurr and Phil Short. They introduced him to the technical diving scene. Pim decided to become an IANTD instructor. In that period CCR's were banned by many diving centers and charters. In those days nitrox and trimix were not available in The Netherlands. They were considered very dangerous, like CCR's... so Pim was forced to blend his own gasses. Nowadays many dive centers provide gasses and oxygen. Pim decided to concentrate and specialize in technical diving. Pim was trained by Tom Mount, Kevin Gurr, Phil Short, Ed Betts and Paul Lijnen. Pim started participating in and organizing of CCR expeditions like the Bunaken/Coelacanth Expedition, Yamashiro Expedition, Carpathia Expedition, Viminale Expedition, Victoria Expedition and Garibaldi Expedition. And of course the Britannic Expedition in 2016. In 2008 (together with two Italians Mario Marconi and Alessandro Scuotto) Pim made a world record wreck dive to the wreck of the Milano in Lago Maggiore (Italy) on an Ouroboros eCC to a depth of 236 mtrs! In 2009 he made the (unofficial) deepest dive on a mCCR (mini rEvo III). He is probably the only diver who did dives deeper then 200 mtr on different CCR's. Pim has over 4000 CCR dives and trained over 1500 students (divers and instructors) on CCR's. In 2016 Pim started to train Special Forces units of different countries. 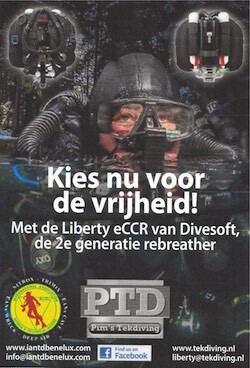 In 2009 Pim became President of DIRrebreather http://www.dirrebreather.com. Pim published several books on (technical) diving and he publishes in the magazines Neptune (Russian) and Duikmagazine (Dutch). He is published the following books: DIRrebreather Manual, DIRrebreather Instructor Manual, DIRrebreather Student Manual, DIRrebreather Ultimate CCR Manual, DIRreberather Rescue Manual, Rebreathers Duiken Zonder Bellen, Technisch Duiken Encyclopedie, Tekdiving Een UItdagende Manier Van Duiken. Next to diving, Pim has a black belt in Taekwondo (6th DAN) and Hapkido (3rd DAN), is a (kick) boxer, pistol/rifle instructor trainer. He is a counter terror instractor (level 3), krav maga and law enforcement instructor for Israeli Tactical School. He also plays golf player (hcp 19.2). Pim is a director/owner of a consultancy firm. He traded in his Noble M12 GTO 3R for a Lotus Evora in 2018. He appreciates a good glass of wine. Pim is also a teacher at a masters program (MBA) in The Netherlands. Pim had four dogs: pugs with the names Trimix, Nitrox, Argon and Heliox. Unfortunately Trimix died in 2013 from a heart attack at the age of 12 years. He had to say goodbye to Nitrox (14 years) and Argon (12 years) in 2015. Yanosch (Molnar) is now a new member of the family. (Oxygen) Booster came around as a puppy in 2016.